Fishermen’s Locker: Wild King Salmon starting at $175 only. Shop Now! Fishermen Locker: Wild Coho Salmon Portions starting at $145 only. Shop Now! Fishermen’s Locker: Halibut Portions starting at $205 only. Shop Now! Fishermen’s Locker: Traditional Smoked King Salmon starting at $160 only. Fishermen’s Locker: Marbled Wild King Salmon starting at $175 only. Get 10% off for a First Time Customer with code CatchAKGold at checkout. Alaska Gold Brand Seafood is caught with pride by the fishermen members of the Seafood Producers. They commitment to quality begins with the careful handling of wild catch the moment it comes on board and continues all the way to when customers receive product. 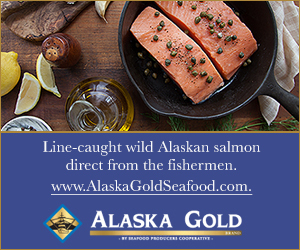 Alaska Gold Seafood is your online destination for hook-and-line-caught Wild Alaska Seafood, like Wild Salmon, Halibut, Black Cod, Smoked Salmon, Albacore Tuna, Canned Tuna, and more. Found a coupon for Alaska Gold Seafood?